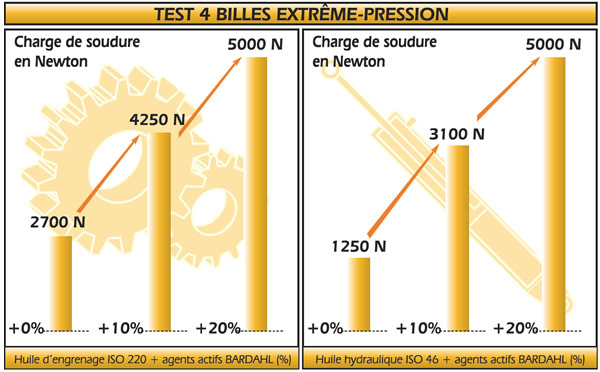 The efficiency of a lubricant can be established with different performance tests. Among them, the 4 ball test which shows best the "extreme pressure" and "anti-wear" performance. The results of BARDAHL lubricants are always exceptional thanks to the BARDAHL molecular film. 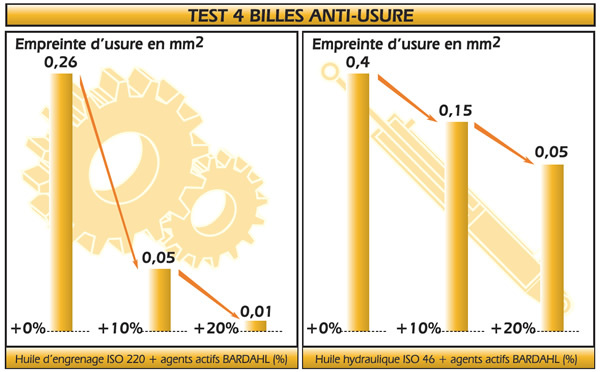 This test shows the lubricant capacity to prevent wear and protect material thereby increasing lifespan under the most difficult working conditions. Wear is reduced by 8 thanks to the BARDAHL molecular film. This test shows the lubricant capacity to avoid seizing during increased loads. BARDAHL lubricants avoid material damage. The load required to effect seizure is 4 times higher when BARDAHL additives are present.